iZHH is an online retailer. We offer Free Return and Exchange. We always take the customer's satisfaction at first. If you have any questions, please contact me by email. We will answer within 24 hours. Gender:Men. Season:Summer. Occasion:Home,Beach. Material:Nylon. Lightweight breathable comfortable pocket short and covered elastic waistband. Excellent flexibility,Good Elasticity and Comfortable,Fashion and Concise.Breathable and Comfortable. Men swim trunk elastic waistband and adjustable drawstring to fit comfortably,The lace-up tie can avoid the shorts from being pulled off the body . 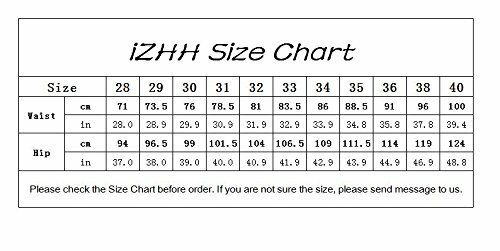 Note: our actual size differ from Amazon size chart , please refer to the product detailed size chart.